Darrell Waltrip is an American motorsports analyst, author, national television broadcaster, and former racing driver. He is also a three-time NASCAR Cup Series champion and a three-time NASCAR Cup Series runner-up. Posting a modern NASCAR series record of 22 top five finishes in 1983 and 21 top five finishes both in 1981 and 1986, Waltrip won 84 NASCAR Cup Series races, including the 1989 Daytona 500. Waltrip currently serves as a color analyst for Fox Sports alongside Mike Joy, and Jeff Gordon. 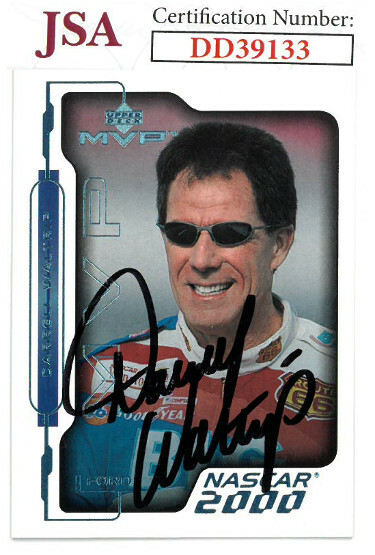 Darrell Waltrip has hand signed this 2000 Upper Deck Racing Trading Card #96. JSA Hologram #DD39133 and Certificate of Authenticity.